You do not need to attend a course to stay at the centre. It is the ideal place to take a break. The centre is open for guests throughout the year except during International Festivals. Rooms are available subject to availability. Click here for more information on booking. The centre offers simple accommodation and vegetarian food at reasonable rates. The staff are mostly volunteers committed to providing service to the public to exemplify their Buddhist faith. Accommodation is in single, twin and dormitory rooms. Linen is provided in single and twin rooms, but if you are staying in a dormitory please bring a sleeping bag and towel. 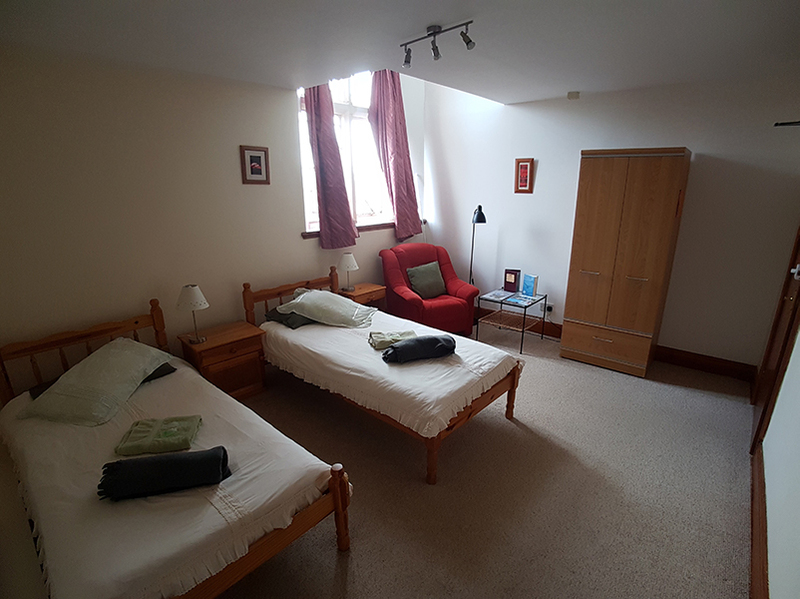 We have a limited number of en-suite twin, double and single rooms which are furnished to a good standard. Some rooms are in self-contained cottages and others in the main building on the upper floors. Some of the cottages have temple views, use of a private kitchen and complimentary tea and coffee. Breakfast and two vegetarian meals a day served in the centre's communal dining room. Meals may include dairy and/or eggs. We can accommodate wheat-free and dairy-free requirements which must be booked in advance. Because we cannot guarantee that all our ingredients are gluten-free or vegan, we are unable to offer these as options. Facilities for disabled guests are available, please enquire for details. Please inform us if you have restricted mobility as many rooms are on the upper floors. All under 18s must be accompanied by an adult (over 18). For their safety and wellbeing we are unable to accept any bookings for under 18s in dormitory accommodation. Under 16s must be under the direct supervision of their accompanying adult. Please plan to arrive during office hours (9.30 am - 1 pm, 2 pm – 5 pm Monday to Friday) where possible. Reception opening hours for courses vary; details of which will be included in your booking confirmation. Reception is located inside the East door - to the left of the building as you approach.